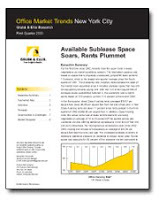 Available sublease space hits 14.6 million square feet. Sublets account for 30% of available inventory for first time since 2002. Manhattan direct Class A average asking rents are down 8% from end of last year. Leasing activity is down 45% as demand slows.